This disproportionately high straw hat is a traditional headdress of the Bedouin shepherdesses of Hadhramaut, a region in southern Yemen. 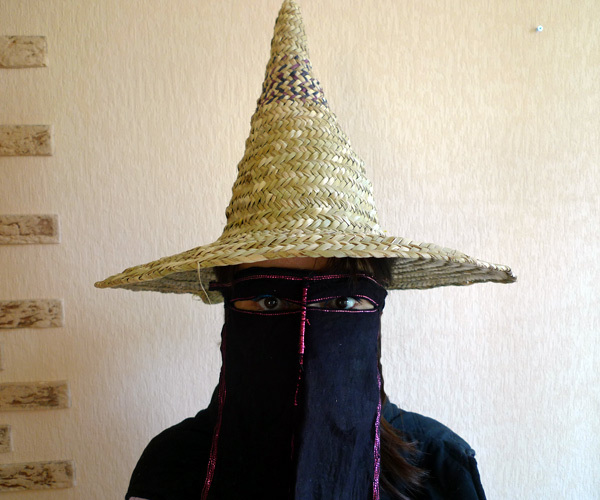 From head to toe dressed in black, with covered faces and slits for eyes, in their peaked hats these women resemble ghosts, and are feared by the residents of Hadhramaut, not to mention visitors from Central Yemen. I failed to take photographs of these beauties for a long time: the driver would simply refuse to stop, assuring that those shepherdesses have guns and they would shoot. There are two types of dolas – the peaked one is usual in the Wadi Do'an valley, while a smoothed version with even higher crown is worn in the neighboring valley of the Hadhramaut river.